Eureka! 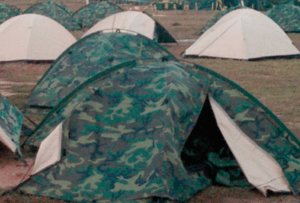 has a history of developing modern, innovative military tents that have become standards in all branches of the military. A supplier in every major conflict since World War I, Eureka! 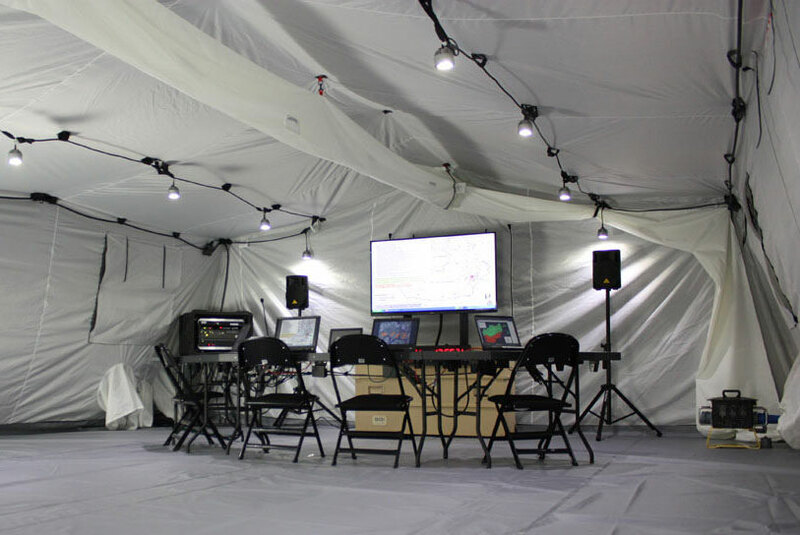 delivers the military tent solutions that meet the ever-evolving mission requirements of soldiers around the world. With MSS Defence we provide advise, supply and training. All over the world! 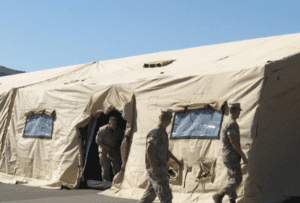 The RDS is a rapidly deployable, highly expeditionary shelter system proven to be one of the fastest and most reliable systems on the market today. The patented truss-style frame system is stronger and more durable than standard “Scissor” style frames. It withstands 150 kg hanging load at any point on the frame. 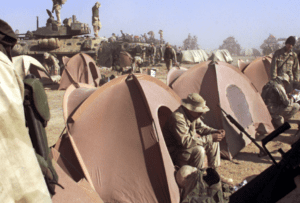 When it comes to force protection at remote base operations in any operating environment, the RDS is the most durable, versatile military tent shelter system. Designed in 1997 the current MGPTS military tent incorporates the latest tension tent design and manufacturing technologies. It provides the military with a multi-purpose weatherproof shelter for any operating environment. 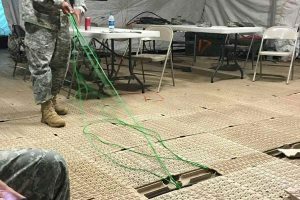 The performance specifications established for the MGPTS are some of the most stringent wind/rain/snow loading criteria to be applied to any military tent system. Another example of innovation, engineering and design. 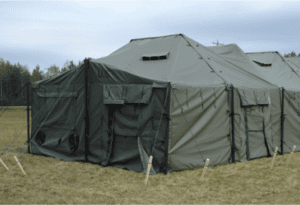 Two-man, three-season, free-standing, double wall military tent. Incorporates a vapor permeable tent body with a waterproof floor and fly, which also provides 1,8 M2 of additional gear storage. Extremely tough and durable. The COMBAT Tent has two openings and shockcorded poles, requiring no special tools for erection and striking. Additionally, the rain fly is adaptable for use independent of the tent body. The TCOP is a unique Eureka! designed military tent produced for the U.S. Military. This individual shelter incorporates all of the important features requested by personnel in the field. The TCOP is designed using durable materials that exceed government requirements and are warranted to stand up to repeated field use. It’s extremely tough and durable. The entire upper body is constructed of breathable nylon for control of condensation. 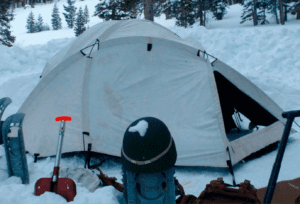 The Extreme Cold Weather tent is a four soldier, all-season, tension pole supported military tent shelter with 5,8 M2 of floor space and an interior height of 1,37 meters. The ECWT weight is less than 11 kg. Each tent comes with two rainflys (woodland Camo and Arctic White) and the fly provides an additional 2,7 M2 of vestibule area. Operable in climates ranging from -32°C to +52°C. Withstands 50 knots steady winds with gusts to 65 knots. The snow load capability is a minimum of 22 kilograms per M2. We supply rugged tent floors with and without integrated cable management provisions. Our patented, anti-static, non-slip plastic flooring maintains its shape and durability over years of use and re-use in all types of harsh, indoor and outdoor environments. Its durability under even the toughest conditions makes it the ideal solution for military, government, commercial, and non-profit organizations requiring portable or permanent flooring that’s impervious to conditions that limit the use and longevity of plywood and other plastic flooring products. We also supply heavy duty trackway systems for heavy duty outdoor use. We supply various types of indoor and outdoor lighting systems. From the more classic LED tubes up to the most ruggedized systems specifically designed for military use. At MSS Defence we’re fully qualified to tackle your environmental control system needs of your next program. Off the shelve or custom engineered, we assist you all the way. We supply generators, air-conditioning units, heaters and trailered HVAC systems. Whether it’s for systems that are self-contained, shelter mounted or towable trailer mounted, you can count on us. And we supply tailored to your requirement and not unimportantly your budget! EUREKA! has a history of developing modern, innovative shelters that have become standards in all branches of the military. A government supplier in every major conflict since World War I, they deliver the solutions that meet the ever-evolving mission requirements of warriors around the world. From one-man combat military tents to complex Command Posts and Tactical Operations Centers, providing these deployable, sustainable, expeditionary, versatile and modern systems is what EUREKA! is all about.